The best watch dogs could be from a breed that might surprise you. Next to working with humans as hunting dogs, being watch dogs was probably one of the first roles that dogs took on when they began hanging around with humans thousands of years ago. Sharing the same campfire with people, it would have been natural for dogs to act as watch dogs and sentries and give an alarm if something dangerous were lurking nearby. Today, even if you simply have a family pet, it can still be comforting to know that your dog will let you know if there is an intruder or if there is danger. Watch Dogs and Guard Dogs – What’s the Difference? Many people don’t realize there is a difference between a watch dog and a guard dog. The best guard dogs generally protect their family or home, or property. It is an innate trait, but the dogs can be further trained to a high degree. Some dogs are specialists in this area. Watch dogs, on the other hand, can include many different breeds. Any dog can bark to give warning. Some dogs are better watch dogs than others, of course. The best watch dogs are better at distinguishing a real threat from something that is just odd or different, like a squirrel running across the patio, or a cat tiptoeing across the yard. Better watch dogs will save their barking for things you really need to know about, like someone coming to your door. A watch dog that barks to warn you about something will not necessarily provide a physical defense, however. They are usually good barkers but they may not be dogs that will attack an intruder. Here is a list of some of the best watch dogs. You may be surprised by some of the dogs on the list. These are the dogs that are most likely to bark to warn you about a real problem. Doberman Pinscher: The Doberman Pinscher was developed in Germany around 1900 as a guard dog and companion. They are brave, obedient dogs, full of energy, and very watchful. They also make good pets since they are loyal and affectionate. They are not only good watch dogs but they do make good guard dogs with proper training. 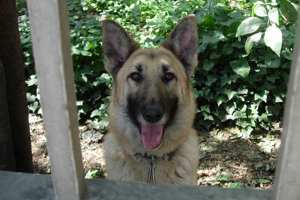 German Shepherd: The German Shepherd Dog was also developed in Germany in 1899 to be an all-purpose working dog. They can be watch dogs, guard dogs, herders, and great family companions. They are very versatile and quite devoted and loving toward their owners. They make excellent watch dogs. With appropriate training, they also make very good guard dogs. Miniature Schnauzer: The Miniature Schnauzer was bred down in size from the Standard Schnauzer in the late 19th century in Germany. They were originally intended to be a small farm dog and to hunt rats and other vermin. They were also meant to give the alarm on the farm and be watch dogs. Today they make excellent family pets. They are very trainable and have a good temperament. They make very good watch dogs and can live in apartments or in the country. Rottweiler: The Rottweiler was developed in Germany from dogs brought by the Romans. They have both guarding and herding instincts. They are devoted family dogs and they make excellent watch dogs. With proper training they also make very good guard dogs. Scottish Terrier: The Scottish Terrier, or Scottie, is an old Scottish breed that was originally created to kill rats and vermin on farms. They make wonderful house pets and they love their families. They do need obedience training. Scotties make excellent watch dogs. Like many terriers, the Scottie is quite bold and they will stand up to anyone. Scotties need exercise but they can do well living in an apartment or in the country. West Highland White Terrier: The West Highland White Terrier, or Westie, is a spunky little terrier with a loving disposition toward his family. He is happy and affectionate. He is also very determined and confident. The Westie makes an excellent watch dog and will defend his territory. He will always let you know if someone or something is approaching. Westies will do well in apartments or in the country, as long as they get enough exercise. Many dogs make good watch dogs. The key point is that the dog gives a good alarm and knows when it is important to let you know there is something going on. Some dogs bark frivolously, but a good watch dog can tell the difference between something unimportant and something important.